"I have to recommend . 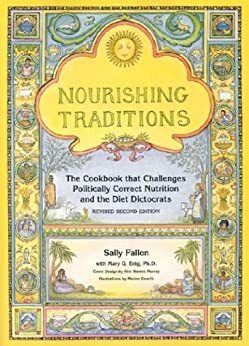 . . Nourishing Traditions by Sally Fallon. The first chapter of her book is so right on target that I feel a little guilty for taking her ideas." Robert C. Atkins, MD"
Old Fashioned AND Modern.... Wholesome, hearty, nutritional, great value recipes. I am currently following the GAPS program and am finding this cookbook has a wealth of information that is really helping me. Awesome, informative book. The recipes are all great and am feeling better and more vibrant after just one week. Well researched and contain a range of recipes to try. Very happy with it. 5.0 out of 5 starsThe book that changed my life, how I think about food and particularly fats. Sally Fallon’s Nourishing Traditions changed my life. Over a decade ago, and in the midst of many life stresses, I got a flu shot at work one year, and suddenly developed all sorts of allergies. I started to develop serious health problems – Asthma, Digestive issues, Raynaud’s, Sjogrens. Worried, I went for the first time in years to my Kaiser doctor, who admonished me about my cholesterol levels (228), and recommended statins. Fearing drugs more than high cholesterol, I told him I’d use natural means to reduce my serum cholesterol. And I did. By ingesting large gobs of oatmeal and by shunning saturated fats, I got my cholesterol down to 180 within the year. I was very proud. But I did not get well. I got sicker. I got every office flu, cough, cold out there. After a final bout of flu on top of flu, and probably driven by some shred of self-preservation, I googled ‘cholesterol good’. That is when I stumbled into the WAPF’s realmilk.com site, sampled some raw milk…and never looked back. I read about the cholesterol skeptics. I read about the incredible conflict of interest between Pharma and human health, and I read about the statin scam (that I nearly fell for). I was hurtling down the modern health highway of food shortcuts, to surefire disaster, and it was pure accident (and the good luck of bad health), that I came upon Sally Fallon and Mary Enig. Not everybody is so lucky. Many people get sick on nutrient deficient diets, then try to cure this with drugs, which have more side effects, which cause more knock on diseases, a vicious cycle that frequently damages them beyond repair. Dr. Mary Enig, Sally’s co-author, was a brilliant lipid biochemist who jeopardized her career to get the message of transfatty acids vs. wholesome saturated fats out to the public. ‘Nourishing Traditions’ and ‘Know Your Fats’ are my go-to food and fat-science bibles. These amazing women resisted bullying and bludgeoning by industry to impart their knowledge and wisdom of traditional food-ways to common people like me. I grasped the notion of ‘body as terrain’ and ‘food as medicine’. I now eat delicious, pastured, fragrant, nutrient dense, food that is rich in butter, cream and coconut oil. I eat ferments, kefirs, kvasses, yogurts, organ meats, broths, stocks and vegetables of course (without pesticides). I prepare my breads the traditional way and the taste and aroma are incomparable. And my belly likes it too. My kitchen is fragrant once again with the Ghee that my mother and my grandmother before her made. Our insurance premiums are completely wasted because we have not been sick in the last eight years. Nary a cough, cold or flu. This way of living and eating has opened up my life in delightful ways to farmers markets, farmers and the wonderful kinship of likeminded people. If you have children, feeding them NT food will make them stronger, smarter and healthier. If you are sick, you will get well on this food. The body WANTS to heal, and is set up to heal, if properly nourished. Many people with chronic degenerative disease I know, got not just better, but were cured. My recommendation is, ignore all other isms, fads and trends. Don’t just borrow the book from your library. Buy it. Take a week off from work to read it, imbibe the wisdom, and pass it forward. Sally and Mary probably saved my life. I am forever indebted to them. 343 people found this helpful. I began reading a lot to try and help keep my mind off of the deep depression I was experiencing (Lack of sleep, stress of being a young new wife and mother, no family in the area, plus my very unhealthy and hormone depleted body). Then, one day I came across the book that I had placed on a shelf two years prior (The Maker's Diet- a great book). 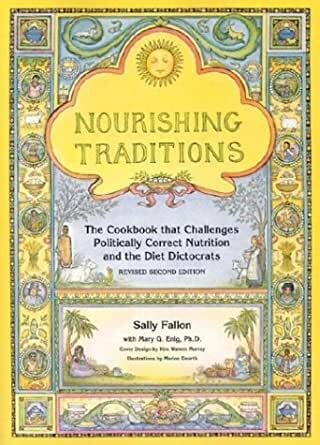 When I started reading through some of the recipes, I noticed many of them were referencing this book called "Nourishing Traditions". I went to Barnes and Noble and bought this book the same week. Instantly saw how informative it was and how packed with recipes! I love it!! It opened my life to a completely new way of thinking/eating/ living. One of the first recipes i came across was the infant formula recipe. I thanked God because I knew he led me there, as I had PRAYED and cried out to God to help me find some way to feed my baby, and in the midst of feeling like such a massive failure for not being able to nurse my son, I realized that God had used my dad to give me The Maker's Diet, which I would pick up two years later out of desperation, which would in turn lead me to Nourishing Traditions... Long story short, I used the website provided in the book to scout out a source of raw milk locally, and within that week I found a raw milk cow share and signed up, and ordered all of the ingredients that I needed and started making my son's formula. From the first feeding, he was a much happier baby! He stopped fussing so much, he started SLEEPING through the night, AND he was NEVER AGAIN constipated! His bowel movements turned to mustard yellow, seedy, soft just as they were when I was nursing him. I'm not saying everything in this book is completely 100% for everyone, but it worked for me and my babies. All of the information also led me into a completely different life as far as nutrition and eating. I try to stay away from grains completely these days as I have some long standing digestive issues, but if I do have them I believe they are best soaked or sprouted like this book says. Also, try sprouted nuts- SO DELICIOUS and so much better for you than roasted or even raw. Lots of good recipes in the book, and you'll get a ton of practice in the cooking and preparing of different foos. If nothing else, get it for the baby formula recipe and information pertaining to childhood nutrition. My favorite and most used part of the recipes in this book are the fermented foods and dairy. 540 people found this helpful. LOVE this book! Amazingly informative. Lots of information about how nutritional studies have been skewed, getting very specific, to push an agenda that is not in the best interest of human health but rather in the interests of profits. The authors are both well respected in the field of human nutrition. The recipes are wonderful, and there are a lot of them. I have enjoyed all of them I have made so far. But of tremendous value is the eye opening look at what nutrients our bodies really need. We do need fats and we do need saturated animal fats. What we don't need is so many carbohydrates, vegetable oils, trans fat and refined foods. This book takes up back to the diet when heart and vascular disease and cancer were not the big killers and tells us why. I have tossed every one of my vegetable oils and now use lard (gasp, but yes, it is better for you) and butter along with full fat raw milk and organic, pasture fed beef and dairy. I already feel better. If you're seriously interested in food science, nutrition, etc., this book is fantastic! VERY in-depth information about so many aspects of food, science, nutrition, etc. I can't believe how long this book has been around and how little-known it is. It seems like there are a ton of recipes and diet plans out there that are all based on this book- I was very happy to find the original source. The only downside is that it is VERY dense. I gave it to my husband as a gift- he's a science geek and a foodie, and reads at the speed of light- and even he thought it was a little overwhelming. I still think it's an awesome reference, and anytime you need to know anything about food, just look it up in this book.